SKT Bakery is a free responsive bakery WordPress theme which caters to cakes, pastries, bakery shop, cafe and restaurant as well as dine and eateries. This free responsive bakery WordPress theme has features which are not even present in some of the premium WordPress themes like Google mobile friendly. Use of popular social media icons so that one can link them to their own. Use of fancy Google fonts so that the site looks very fresh and new as well as modern and beautiful. Use of bigger slides on the top so that it looks nice. Right sidebar page template and use of blog. This free responsive bakery WordPress theme has sidebar widgetized as well as footer is very nice with 4 columns and contact and twitter as well as menu present. Has facility to add upto 5 levels of drop down and threaded comments. As well as has ability to showcase gallery with compatibility with Nextgen Gallery and can host products for sale using WooCommerce. 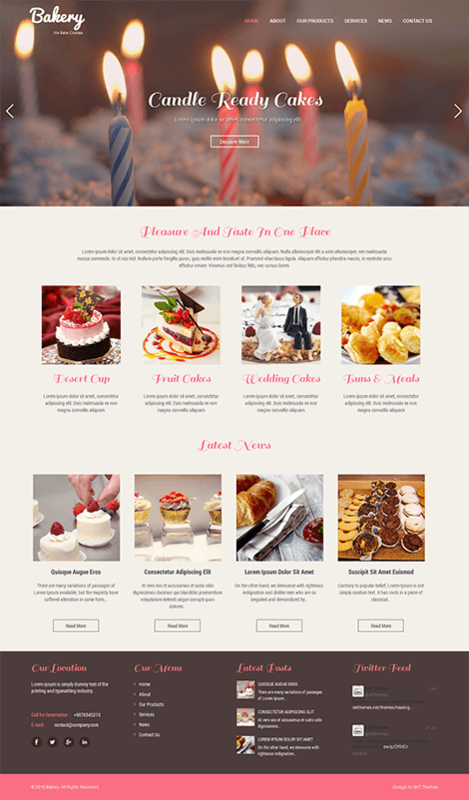 This template can be used for cake shop, pastries as well as bakery and cookies and any type of wedding cakes and other types of websites. Since it is clean structured and transparent banner on the top can be used for any type of websites like business. It has a great transparent menu on top which can have 5 levels of drop down. Sidebar is fully widget friendly and can hold any number of widgets. Footer has call to actions with location, and social icons given as well as widget friendly social media widget area. Documentation You can check documentation link above. The business owners often look for suitable online websites. The business these days cannot survive without the use of these websites. In fact, there is research which shows that the most effective way of promoting a business these days is with the use of websites. The business owners thus have been making all efforts to create an online presence that will directly influence their business. What they forget in the process is that these websites are created with a lot of efforts. The use of the WordPress themes thus comes in very handy, they are designed by professionals who efficient in what they do. The bakery or the savory business also requires a website that can connect with the customers in the geographical location. The free bakery WordPress theme is designed for this business owner who wants to create an impressive website for the users. This is realized that ever business niche has their specific demands when it comes to a website. These demands are kept in mind by the users when they are designing the themes. It is because of this reason that the themes which are designed has high functionality and all related features that might be required by them. Talking about the free bakery WordPress theme it comes with high compatibility with other device. This means that the increasing trend of mobile use for access of website is taken care of. The website owners needs a mobile-friendly website in today’s world as more than 80% of the population uses mobile device for the use of internet. 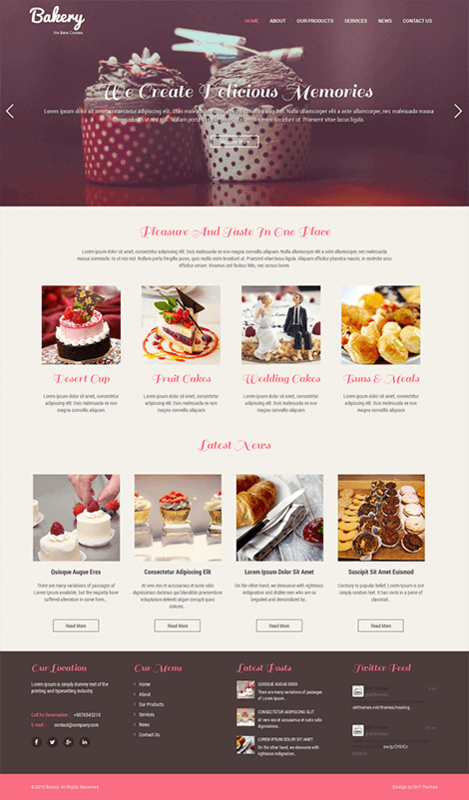 The free bakery WordPress theme is also cross-browser compatible, this means that the different browsers which are used by various visitors on their systems allow the website to load with all its features. The visitor’s who visit a website that is broken or takes higher time to load is not liked by them. They often bounce off from these websites and this means that the business has missed out on a target customer. Since we are talking about the bakery business WooCommerce becomes very important. The bakery owners would like to take orders online and will require a safe payment system as well. The free bakery WordPress theme has Woocommerce compatibility and allows the business owners to involve all forms of selling. The important part of a bakery business is its geographical limitation. The business cannot work without allowing the customers to know their geographical whereabouts. This means that maps would be required to be included in the webpage. This will not take a lot of time as the website allows this with a single use of a plug-in. WordPress themes allow huge number of plug-in compatibility. This means that along with the plug-ins which is designed by WordPress the website will also be able to use the third-party plug-in with ease. This enhances the function of the website and improves the website’s performance. The free bakery WordPress theme is thus a great option for the owners who wish to create a good website with high functionality. Since it is integrated with WordPress customizer so one can modify it with great ease as per the requirements of the changing conditions of the market, to maintain competition and to satisfy customers needs. When anyone requests for your website it is expected by them that your website loads faster otherwise they will bounce off to any other competitive site. So, by using this theme you can effectively achieve this feature as theme is integrated with various cache plugins. One thing which is most vital as compared to the other feature and cannot be ignored is the security of your site. You can manage security skillfully as different security plugins are being incorporated in this theme. Free Bakery WordPress theme is coded keeping in mind different SEO aspects as these days this is primary requirement of almost any of the websites. It is also compatible with different SEO plugins. This way visitors can find your site in the top Google search rankings and in turn, traffic of your website can be increased. There are a large number of Google fonts have been integrated so that it is easy for you to change fonts as per your choice which can provide a unique and splendid look to your website. As this is coded with HTML and CSS3, therefore, provides a more user interactive view of the website and can provide an elegant look and feel to your site. One can easily translate it to any other language with the use of LOCO translate or PO edit, so it can be used potently to design a global website which can reach a large customer base and as a result, you can earn name and fame effectively. Can be used with different plugins so you can use various plugins and can update existing features and functionality even after designing website. One can easily navigate through various sections which are included within the website with only one click on the different menus which are listed in homepage. So, it provides easy usability to the any visitor. “Our Products” section consists of different products which are being provided by your bakery or shop, with price and eye-catching images of products. After seeing such images visitors are tempted to take a deep look into your website. Various social media buttons are also included in the footer section so that any visitor can follow your social media pages easily and as a result, traffic to your website increases to a great extent as social media is on a boom these days. Any visitor can also take reviews of your bakery or shop with the section “Our Happy Customers”. It will be useful for you also as by using this section you can analyze traffic to your website and can do necessary modifications based on the customer reviews. There is a section named “Our Bakers” which gives a brief description of the chefs or experts who are working in your bakery and provides delicious stuff to your customers. You can also include videos of the numerous tasty and delightful recipes so that visitors can get various ideas of cooking from your site. This will be an added advantage which will be a part of attraction for the visitors. “Latest news” section consists of the blog, posts or articles related to the cooking stuff by which visitors can get a brief idea about latest trend cooking. Free bakery WordPress theme is very well designed which is best suited for bakeries, restaurants and small shops dealing with food items. It has all the qualitative features incorporated, which are required by a well-maintained business website. You can generate more revenue after designing your website with this theme.